It still doesn’t feel real. After all of those months of running, training, and visualizing crossing that finish line I still can’t believe it actually happened. And while things didn’t end up exactly how I pictured them, I would still go back and do it again in a heartbeat. Initial weather reports showed a relatively cool and cloudy day. Perfect running weather. Then precipitation started creeping into the forecast. Then it came pouring in. Along with potentially strong headwinds. 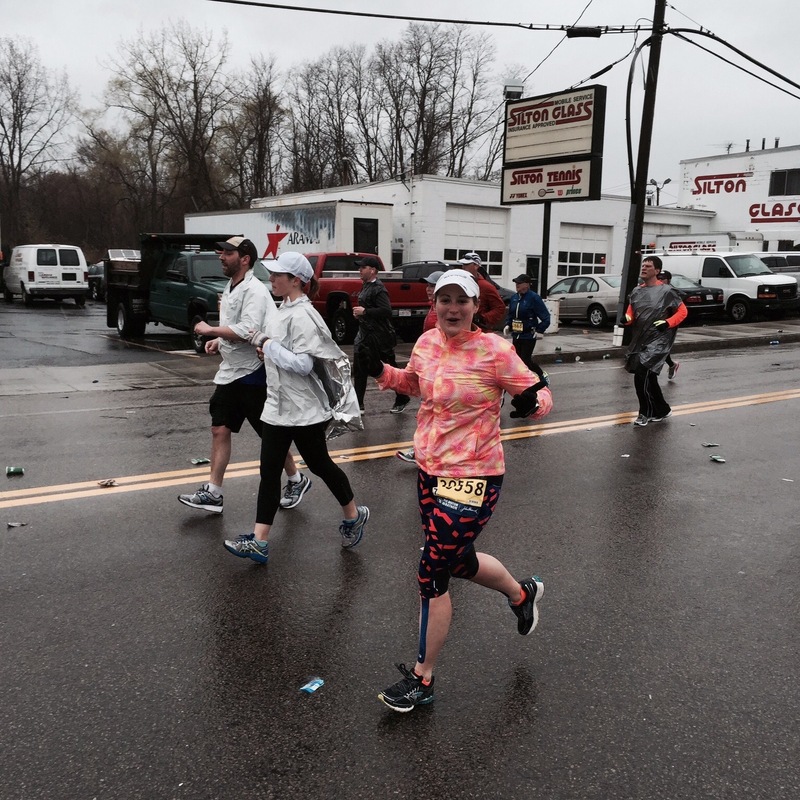 By Marathon weekend there was no question about it – it was gonna rain. And it was gonna be windy. I of course was completely distraught. 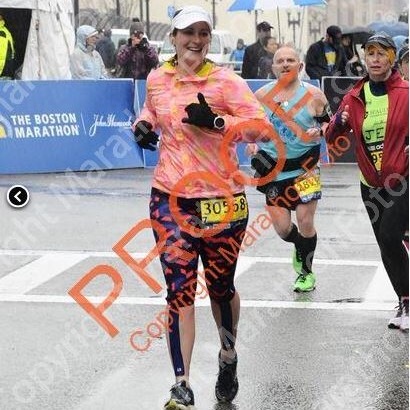 My first marathon, the BOSTON Marathon, the BOSTON MARATHON after training in the WORST winter ever… and this was how it was going to end? I had a few meltdowns but by Sunday I had come to peace with the fact that it was out of my hands. After a couple last minute outfit changes I went to bed praying that somehow things would change by the next morning. It had happened the day of our wedding so why couldn’t it happen again? After a few hours of restless sleep I woke up to a gray and chilly morning. My husband drove my buddy and I to the bus and I sat in the passenger seat trying to shove an english muffin down my throat with shaky hands. After saying our goodbyes we climbed on the bus and rolled towards the Pike. I kept my eyes closed for the most of the riding, hoping that if I didn’t watch the road it wouldn’t seem as far away. I think that made it even worse. Finally we pulled into the Athlete’s Village and I felt my stomach lurch as the bus settled in the parking lot. I was officially stuck in Hopkinton. The next few hours went between feeling like I was watching paint dry and time flying before my eyes. On one hand I just wanted to get this thing over with but I feared the hour or so that I would be left “alone” on the bus – my speedster bestie had a qualified number, meaning she had about a 45 minute head start. I had been trying to act brave and that I didn’t realize this was going to happen but in fact I was terrified. After our hug goodbye outside of the bus I quickly turned away and hurried back before she could see me crying. I had never felt so alone and unprepared. As I slid back into my seat I unfolded a stack of paper she had handed me as she left. Slowly I unfolded page after page of letters from my friends. 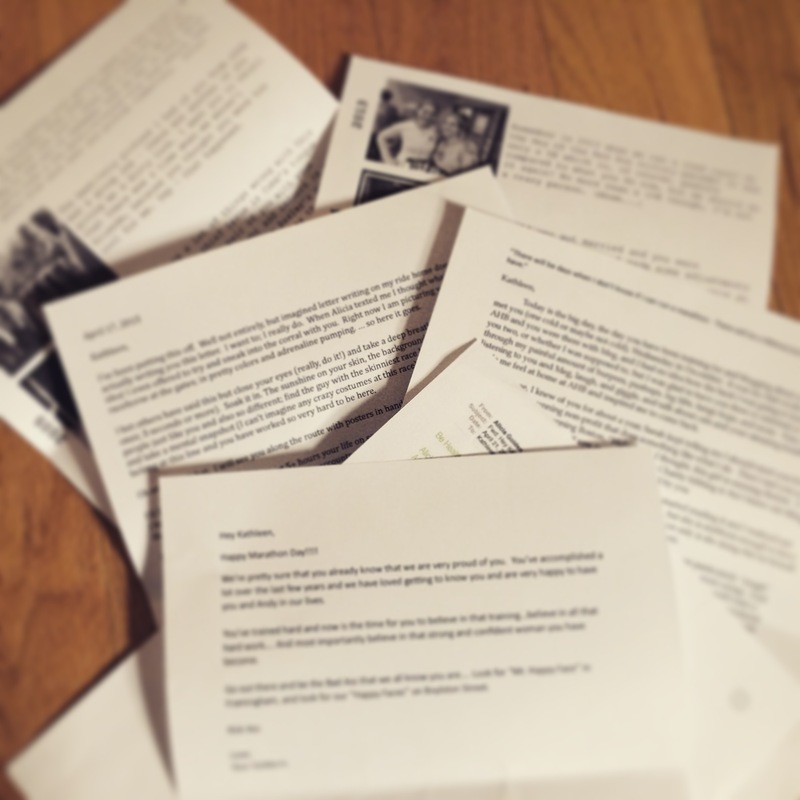 My hands shook as I read note after note, telling me how proud they were of me, how inspired they were by me, or just funny memories that they knew would make me laugh. My nervous tears turned into big, fat, happy ones. Suddenly I didn’t feel so alone. They were all right there, all these people who love me and were cheering for me were right there beside me. As it got time to head to the start corrals I tried to memorize their sweet words for the long journey ahead of me. I stepped off the bus and took a deep breath. It was time to go get my Boston. As we exited the Athlete’s Village the wind began to pick up, and the rain drops fell more steadily. All around me runners lunged for abandoned ponchos and pieces of clothing on the ground. I looked up at the sky and laughed manically. 108 inches of snow, and now wind and rain – challenge accepted. I kept my eyes wide open as I moved to the start line, as I took those first few steps of my journey. I looked all around me, just taking it all in. 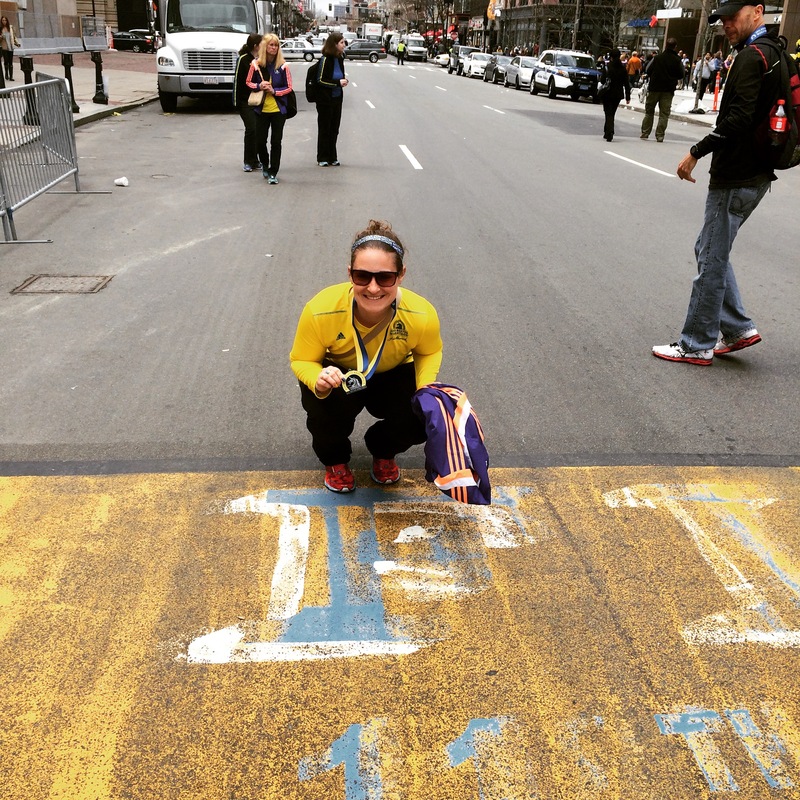 “I’m running the Boston Marathon! 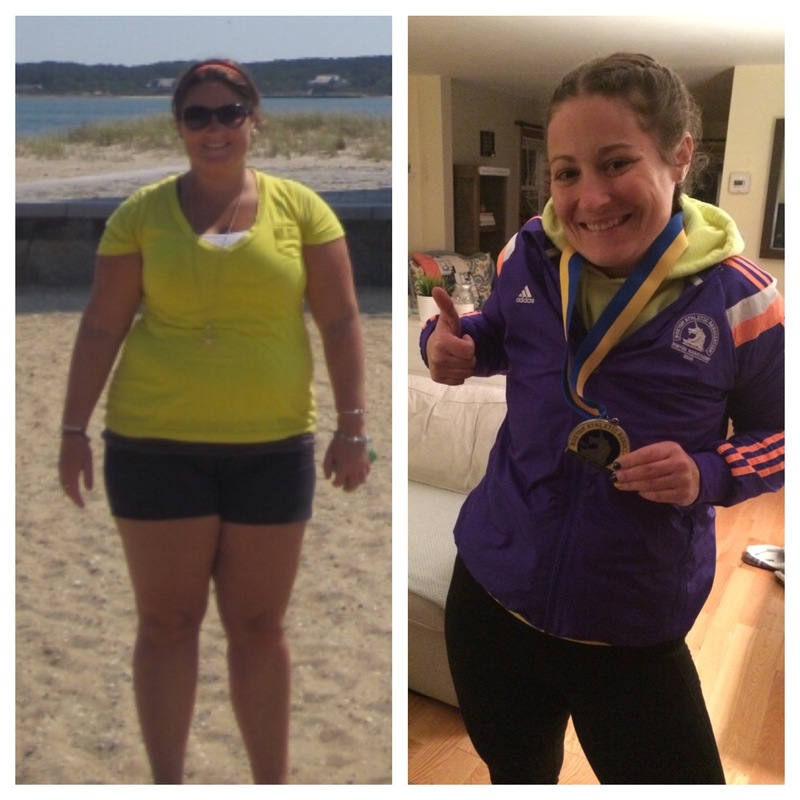 I’m running the Boston Marathon!” I kept repeating in my head. My watch beeped with the first mile and I grinned. Piece of cake. I gawked at the guys who leapt to the side of the road to pee, I threw up some fist pumps to the drunk spectators outside of the biker bar, I high-fived every adorable kid. I wanted to take every single ounce of this in. Despite the first few miles feeling relatively easy things started feeling hard early. Earlier than they should have. My grumbling stomach as I crossed the start line should have been a clue that I hadn’t had enough for breakfast. I was barely ten miles in but felt as though I had run sixteen. Not good. The wind and rain picked up, my head felt heavy, my feet even heavier. I started to get terrible cramps in my legs that I had never experienced before, and I hadn’t even hit the worst part of the course yet. Those horrible voices started to creep in. “Maybe this isn’t going to happen today. 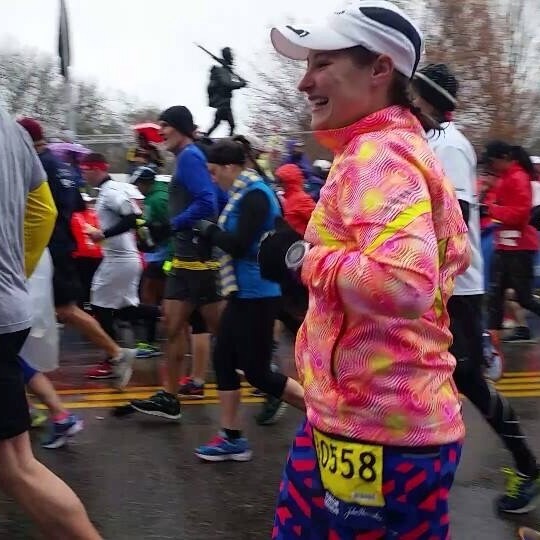 Maybe you’re just not cut out to run a marathon.” There’s a lot I remember about this point in the race: I remember panicking as I frantically looked at the people around me, who were all far too involved in their own personal races to see that I needed a verbal boost. I remember the stretch of road where I just wanted those familiar feet running next to me, even if it meant she was yelling at me telling me that I was stronger than this. 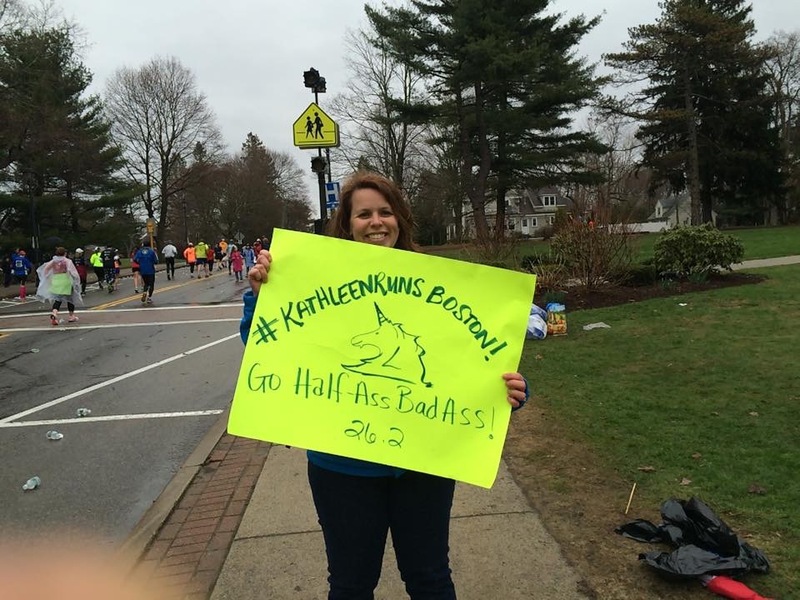 I wanted to be a volunteer, a spectator, home in my warm bed with my kitties… ANYWHERE but running the Boston Marathon. Despite the fact that I wanted to pull over to the side of the road and call my husband to come pick me up do you know what popped into my head? 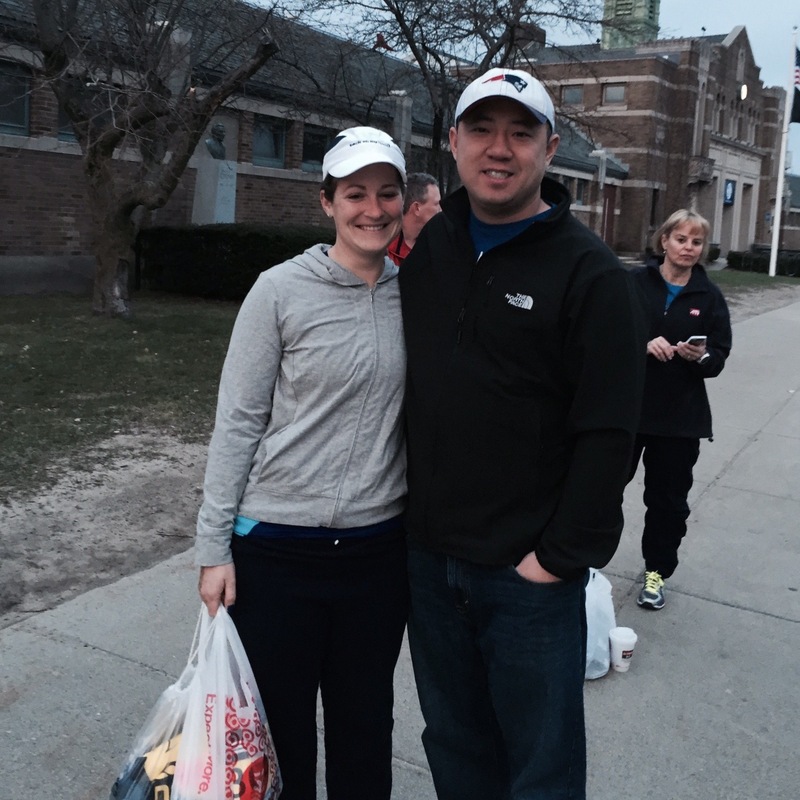 “I just bought all this Marathon apparel that’s non-returnable. What will I do with it?” So I kept running. Whatever works right? Just as things seemed pretty dark and dismal I felt a hand on my shoulder. Two of the ladies from L Street had caught up to me and asked how I was doing. As I fought back tears they reminded me that I was stronger than this, that everyone was having a tough day and that we were going to get through it. Physically they only handed me a packet of salt and a few pretzels, but in reality – they were what kept me going. I pulled out my iPod (my goal was to run without it but brought it in case I got desperate) and listened to the familiar songs that had kept me going all throughout training. I pretended it was just another training run. That eventually I would catch up to the next water stop where everyone would be chatting and eating Sweedish Fish. And in my tired little brain – that worked. I kept on running. I have to say here that my friends, cousin, husband, parents – they were my LIFESAVERS. I kept trying to remember who I was going to see next, and wanting to see them got me through whatever mile I was in. My parents were standing in the pouring rain just past the firehouse and I started crying that I couldn’t do it and I remember my mom saying “You ARE doing it”. I might be 30 years old, but a hug and a kiss from my mom still makes everything better. 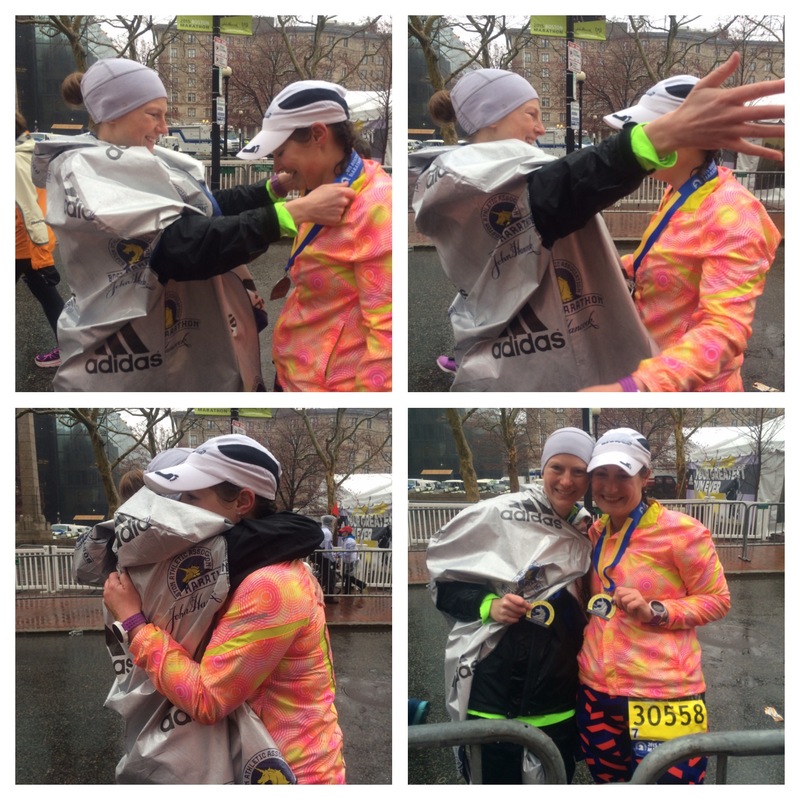 My husband was waiting at the top of Heartbreak Hill smiling at me and with another stop for a hug and a kiss he reminded me how close I was. For the first time finishing this thing actually seemed possible. I walked when I had to, ran when I could, told myself I didn’t care what my time was but that I was going to make it across that finish line. I stopped to hug my friends who were soaked to the bone but still cheering as they frantically waved signs and screamed my name. 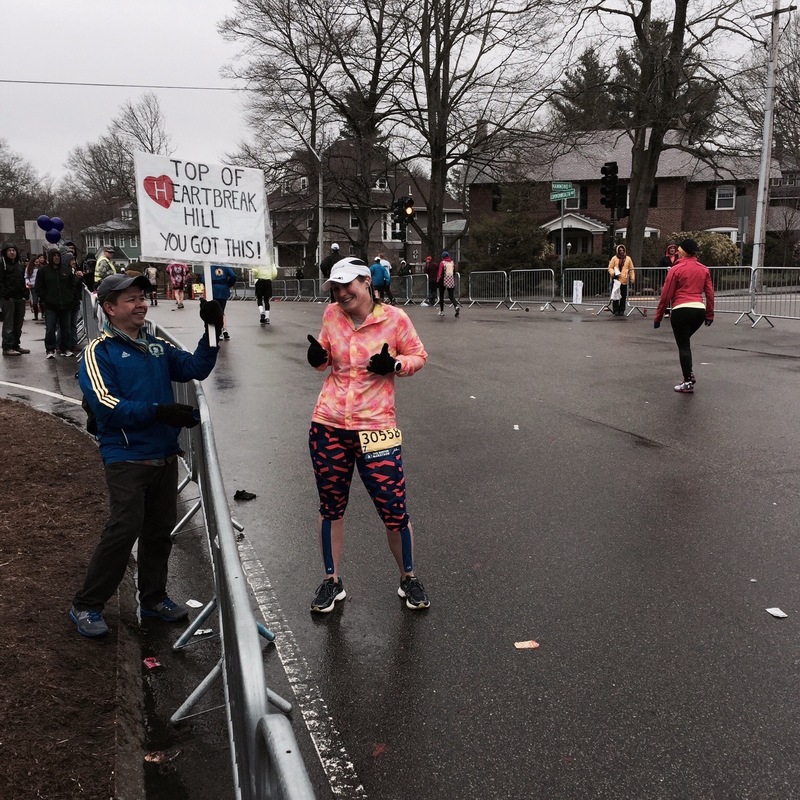 I was pleasantly surprised to see my brother and his girlfriend waiting at Mile 22. Mile by mile, step by step, I made my way towards Boston in my squeaky wet shoes. I’ll never forget the moment the CITGO sign finally appeared through the now driving rain. I sloshed through Kenmore Square with huge tears rolling down my face. The few spectators left who were apparently water resistant kept telling me how great I looked, but I know they were lying. I quickly learned that “Just one mile to go” means that will be the longest mile you have ever run in your life. As I crawled my way under the last overpass I found myself in step with a woman named Jessica. This was her second marathon, and she was struggling just as much as I was. I remember her saying “Ok girlfriend here’s what we’re gonna do: we’re going to take this turn onto Hereford (OH HECK YES WE WERE) and then we’re gonna turn onto Boylston. And we’re not gonna stop until we hit that finish line”. With my new best friend beside me I picked up my feet and my pace. Despite the rain pouring down my face I forced myself to keep my eyes wide open – I didn’t want to blink in fear that I would miss one second of this incredible view. A view that I had been waiting months, years to experience. A view I never in a million years thought I would get to experience first hand. Taking the left onto Boylston Street nearly took my breath away. 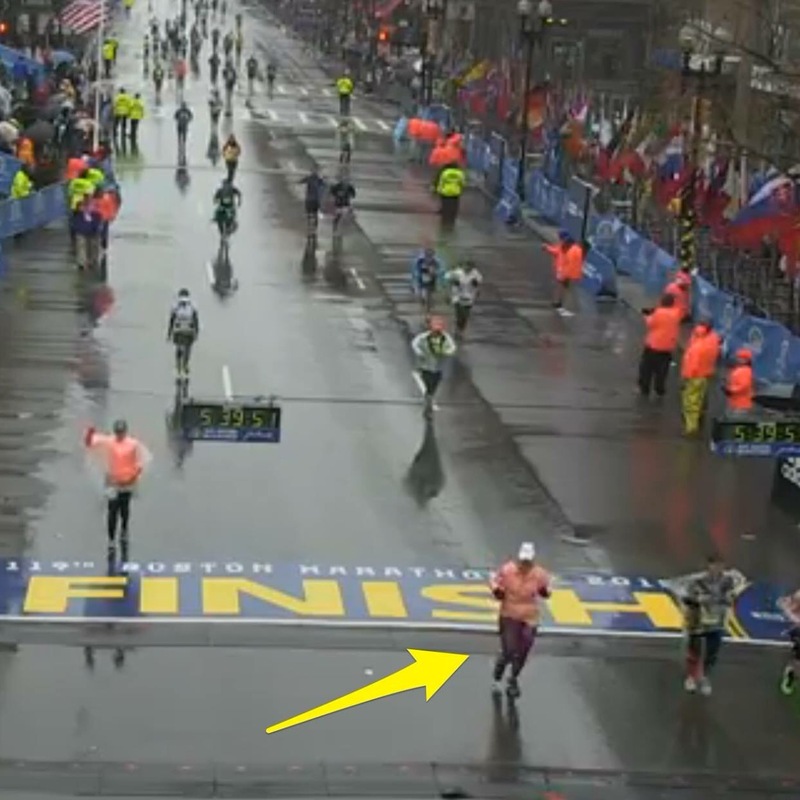 The rain made it hard to see 10 feet in front of you, but I don’t think a blizzard could have blocked the view of that finish line. I’ll never forget how in that moment the pain I felt wasn’t in my legs anymore – it had moved to the smile on my face. I propelled myself forward, wimpering as I inched closer and closer. In my mind I was flying but I’m sure in reality I made a snail look like a Kenyan. I heard an airhorn and turned my head to see my friend’s parents waving and screaming. I laughed hysterically. 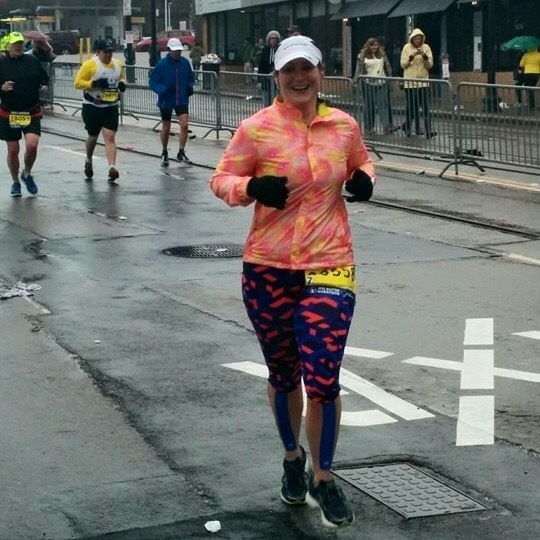 After five hours, thirty two minutes and forty seven seconds I became a Boston Marathoner. Before I could even process what had just happened I saw in front of me the face I had been waiting 26.2 miles to see. Despite finishing roughly an hour and a half earlier my buddy had been there waiting patiently for me. And although my legs and my brain were disoriented the huge smile on her face told me the only thing I needed to know. I had done it. I had finished the marathon. Although I was shivering and soaked through my clothes all I wanted was that glorious medal. I clutched her hand as I hobbled along and she asked if she could be the one to put it on me. The volunteer was not only kind enough to hand my medal over to her, but offered to take pictures of it all. I am so happy that I have these since things started to get a little blurry at this point, and in my heart this is how I had wanted it to end. It meant the world to me to have the person who has guided me along this journey be the one to place that medal around my neck. Unfortunately these are the only finish line pictures I have since after this I spent some quality time in the medical tent due to the fact that you know, I had just run 26.2 miles in the freezing cold rain. But once I finally got home that night I sat on the couch and just stared at the blue and yellow in my hand. I had dreamt of this for so long. And it had finally happened. I know it sounds absolutely cheesy but in that moment the words “You can do anything you set your mind to” had never rang truer. I had lost over 60 pounds. I became a runner. I trained through the worst winter Boston has ever seen. And I had just finished the Boston Marathon in the worst conditions. There’s no doubt in my mind that I can do absolutely anything now. People keep asking me “so what’s next?” and honestly right now I don’t know. All I know is that I want to stay in this moment a little longer, soak in this incredible accomplishment, and wear this jacket until the night flash threads wear thin. My legs are finally starting to feel better but my smile? Yeah that still hurts. Posted on April 23, 2015, in Uncategorized. Bookmark the permalink. 19 Comments. I loved that your friends wrote you those notes . I also wanted to ask if you put a 26.2 on your car. I grinned for the first few weeks whenever I saw mine. So wonderfully written, I love how you captured everything. I heard the weather was brutal this year and I was thinking of you and hoping so hard that you would make it through and finish. You rock and are such a wonderful inspiration!!!! Kathleen! I just found out you had a blog (since we just became FB friends haha)..Im totally going to be a reader…and this post was amazing. I teared up at least 5 times.. Congrats!! I may have cried reading this because I am so happy for you. Amazing, AMAZING job!